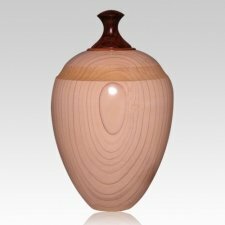 The Magnolia Wood Cremation Urn is handmade from one of our wood artists the wood is finest Magnolia white wood from selected trees. The wood urn is crafted on a hand turned lathe from logs of native woods. Only solid hardwood logs are used they are hollowed out to make this elegant cremation urn. To finish the urn urethane oil is used which penetrates the wood rather than just putting a finish on top of the wood. No two wood urns will ever be the same, because the wood color and texture will always differ. A truly one of a kind unique urn for your loved one.